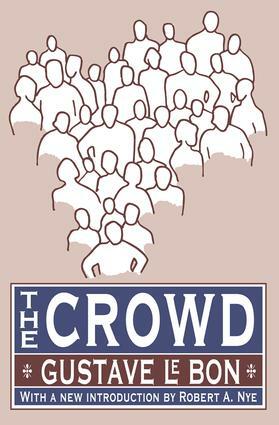 Gustav Le Bon's The Crowd is not only a classic, but one of the best-selling scientific books in social psychology and collective behavior ever written. Here, Le Bon analyzes the nature of crowds and their role in political movements. He presents crowd behavior as a problem of science and power, a natural phenomenon with practical implications. Originally published in 1895, Le Bon's was the first to expand the scope of inquiry beyond criminal crowds to include all possible kinds of collective phenomena. Its continuing significance is evident even in the Los Angeles riots of 1992 in which Le Bon's theories were citedin testimony. Le Bon emphasizes the various areas of modern life where crowd behavior holds sway, particularly political upheavals. He focuses on electoral campaigns, parliaments, juries, labor agitation, and street demonstrations. At the same tune, his treatment of crowds is far from complimentary. He likens crowds to "primitive beings," social formations barkening back to the evolutionary origins of humankind. Le Bon believed that ideas and images spread through a crowd by means of contagion, an automatic process that produces a state of transitory madness in its victims, extinguishing reason and will. Yet he does more than dwell on the pathologies of crowd life; he also writes of the heroism, the generosity, and the sacrifices of crowds, of the indispensable roles they have played in erecting the pillars of modern civilization. In a new introduction to this edition, Robert Nye presents a broad analytical understanding of the relationship between power and knowledge hi crowd theory. He also discusses the historical circumstances and the various personalities who have shaped our understanding of crowds. Nye emphasizes The Crowd's continuing usefulness to cultural historians, psychologists, sociologists, and political scientists. He also places Le Bon in a rich tradition of European social theory.